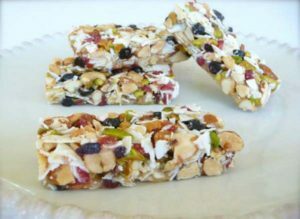 *My favorite way to make them is to eliminate the dried fruit, cocoa nibs and coconut and use all whole nuts, I use 3 cups nuts and do not add the dried fruit, cocoa nibs or coconut flakes. Preheat oven to 300 degrees. Trim parchment paper to line a 8×8 inch baking dish, leaving parchment paper to hang over two sides of the dish. In a large bowl add the honey, coconut flour, nut butter and salt. Stir until well combined. 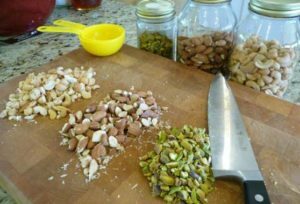 On a large cutting board, coarse chop a couple of large handfuls of assorted whole nuts. Measure out 1 1/3 cup of the chopped nuts and add them to the honey mixture. Next, chop the dried fruit and measure out ½ cup and add to the honey mixture. Finally, measure 1 cup of coconut flakes. Place coconut flakes on the cutting board and course chop. Add chopped coconut flakes to honey mixture. Place the bar mixture into the parchment lined baking dish. Fold overlapping flaps down and evenly press the top of the bar mixture firmly to pack in the ingredients so they hold together better after baking. Then, peel back the parchment flaps from top of bars. (Do not trim, as the flaps make it easier to remove the bars after baking). Bake for 20 minutes. Then remove from oven and allow to cool on stovetop for approximately one hour (or until bottom of baking dish is room temp). Place in freezer to continue cooling. Once nearly frozen (about 45 minutes to an hour), remove dish from freezer. Then, run a knife along the two edges without parchment. Using the parchment paper ends, lift the bars from the baking dish and place on a cutting board. Cut into 8 bars and individually wrap and store in freezer. No need to thaw. However, for best results, bars should be kept cool so they do not become over sticky. Note- you can use any combination of nuts, such as almonds, walnuts, cashews, pistachios, peanuts, etc. Just be sure to rough chop the nuts first and then measure.